My name is Eunice Linah Tachie-Menson. I am proudly Ghanaian and come from Cape Coast in the Central Region. I come from a family of six, and being the first born of three girls, my younger sisters look up to me as their role model and therefore much is expected of me. My parents did not have the opportunity of having a high-quality education. Hence, they always did their best to support me, and that has been my motivation since childhood. I also in return always excelled academically. It was in my junior high school that I recognized my leadership potential, and as such, I became the Girls’ Prefect and President of Girls’ Imparters, an all-girls club whose mission is to educate young girls about girl-related issues. Charity is something I have always been passionate about; I was so glad when I came to Ashesi and found out about Future of Africa, a club that seeks to help street children. After senior high school, I did not want to follow the usual norm of going to the university straight away; I wanted to learn more and challenge myself. African Science Academy was the place to move out of my comfort zone; I did A-level math and physics for ten months instead of the usual two years. It gave me an opportunity to give back to my community by teaching math and science at the Star Basic School and also build upon my leadership and communication skills. Being a Jim Ovia Leadership Foundation Scholar means I will be able to achieve my career goals and help give back to my country. This is very important to me. I am very grateful for this opportunity, and I would like to thank my scholarship donors. Due to their strong support, they have placed big smiles on the faces of my parents. I promise to utilize this opportunity so that I will become a change maker in my family and nation at large. I profoundly believe in Ashesi’s mission to create more ethical and entrepreneurial leaders. I want to be a change maker, and I feel that the best way to do this is the privilege of being an Ashesi student. 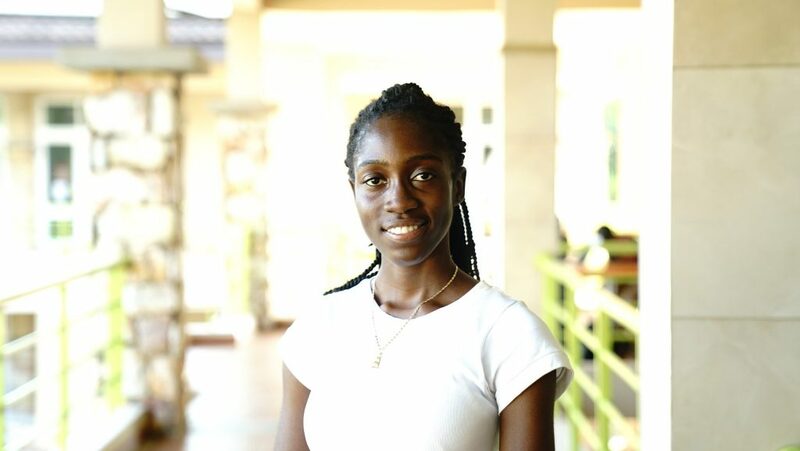 Ashesi gives me an opportunity to explore other courses and not just concentrate on my majors. It also gives me hands-on work. Being at Ashesi will increase my curiosity and improve my problem-solving skills. Here at Ashesi, I get opportunities to volunteer and give back to my community. I plan to study Electrical & Electronic Engineering because I want to use my knowledge in electronics to make an impact in the energy sector in my country Ghana.